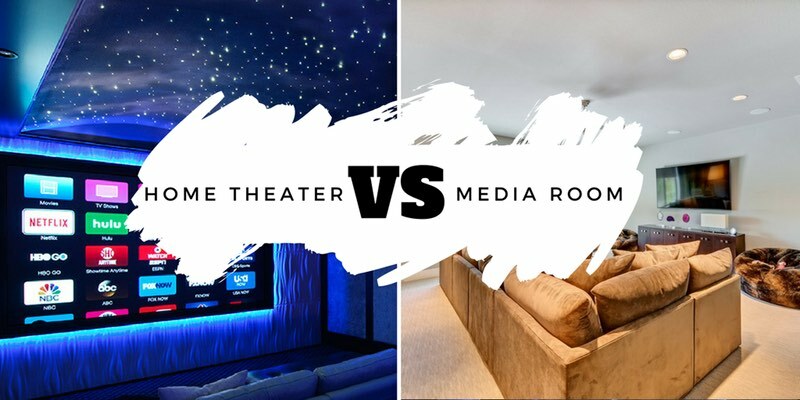 Have you heard the terms Home Theater and Media Room and wondered, “What is the difference?” The primary difference is that a home theater is a dedicated room for TV and movie viewing, while a media room is somewhat less specialized. Read below to see which is right for your Dallas home. A home theater is an entire room dedicated to giving you that Hollywood style movie experience. In Dallas suburbs like Southlake, McKinney, Frisco and Westlake this often means a windowless room, usually with reclining theater seats and details like fiber-optic star ceilings. In short, it is designed and created as a unique space to allow for complete control of lighting, sound and comfort of the viewer. A Sony or Epson 4K projector, Screen Innovations projection screen and surround sound system are the key components of the room. However, all aspects of the room, including the ceiling, paint, fixtures and carpet, are designed to assist with sound dampening and controlling the light levels. Theater style seating is usually arranged in permanent, tiered rows that face the screen. The room can be customized with a theme to express a personal flare and provide a unique cinema experience. Since a home theater is a dedicated room, it may not be the right choice for every house or budget. A media room on the other hand is a multi-use type area where a comfortable sitting arrangement is more conducive to family and social interaction. Since there is not as much control over ambient light, a window shading solution may be required to prevent glare and create an optimal viewing experience. A large Sony 4K OLED television, 5.1 or 7.2 surround sound system and well placed speakers will provide the ideal experience for watching sports or movies, playing games or just listening to music. Typically in-wall or in-ceiling speakers from companies like Origin Acoustics and Triad are used to provide more space and meet a more demanding aesthetic than an average home theater. A media room allows for a more flexible use of space and may require a smaller budget, particularly since that space can fill multiple roles, such as a game room, kids gaming area, etc. Whether you choose a home theater or media room, either choice is a great addition to any Dallas home. You need to ask, “Which room fits the needs of my family and my home better”. Our staff can help guide you through the choices and answer your questions to help determine which choice is the best option for you. If you are considering adding a new space, or remodel an existing one, call Audio Video Innovations today to start designing the perfect media room or theater for your home.